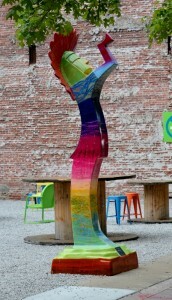 So what is all this local buzz about the Pop-Up Park in downtown Wichita? Well, let me tell you, it’s pretty amazing! I’ll be honest, I was a little unsure when I stepped up to my first food truck experience, but the food was good…darn good! Go back tomorrow good! And, after devouring grilled Hawaiian deliciousness and relaxing to music from an acoustic guitar, I walked back down the street to my cubicle feeling as though I was in a big city! 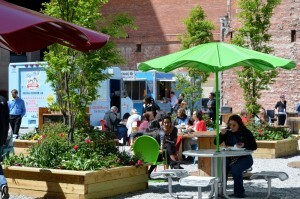 Lunching at the Pop-Up Park was an all-around feel good experience! I returned to the office happy and motivated, and I got so much accomplished that day! It’s amazing what a little sunshine and fresh air will do for you! Market. “The Hole” was created in 2007, when redevelopment plans by the previous owner fell through. Through the recent grant from the Knight Foundation of the Wichita Community Foundation, a temporary Pop-Up Urban Park has been constructed. “The Hole” was filled with excess dirt from nearby development projects and covered with gravel. 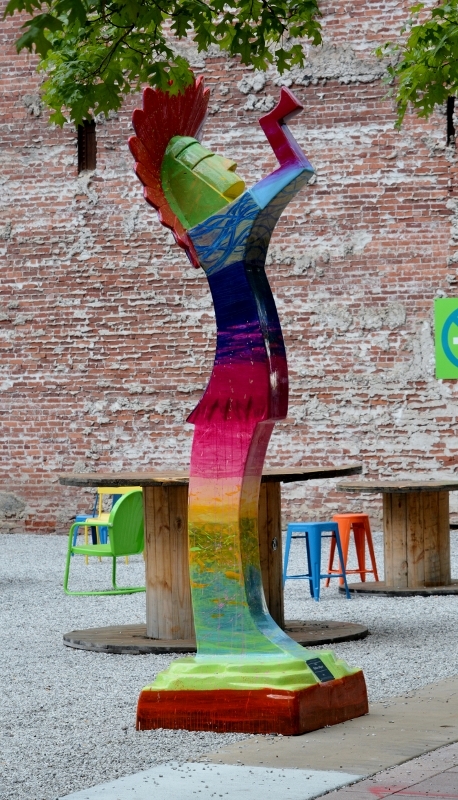 Colorful seating, refurbished items and donated art has brought the area to life! The developers Robert Eyster and Michael Ramsey plan to develop the area eventually, but for now, the park will remain for another few years. ICT Pop-up Urban Park offers lunch, coffee breaks and dinner Monday through Friday and hosts special events on weekends throughout the year. Like and follow ICT Pop-Up Urban Park on Facebook, where you can find monthly food truck schedules and fun events.